Book a room or suite in our retreat and enjoy MORE Niyagama House for LESS money. This discount is only active on our website. So just go ahead ;-). We do welcome all people to spend some hours of relaxation in our beautiful retreat. 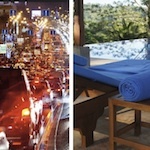 Come early in the morning, enjoy a yoga class and maybe a massage after breakfast. Or just chill at our marvellous pool in combination with a tasty lunch or dinner. Please contact us in advance, so that we know that you are coming. We also can arrange our tuktuk driver to pick you up and bring you back to your place. > Niya Spa Treatments: please have a look here. > 120 min afternoon Yoga class, 4 to 6pm (3,800 LKR). Have a look at our Yoga Calendar to find out which afternoon class we offer on which day. > Maybe a wonderful dinner as a highlight of your day? 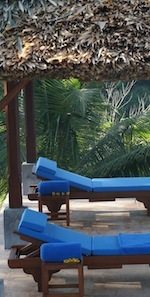 >>> Special Offer: If you book a Yoga class or a Spa treatment, the use of the pool is free of charge :-). Book 2 nights, either Friday to Sunday or Saturday to Monday, with a wonderful 50% Discount. And pamper yourself with Hatha, Yin or Aerial Yoga and Ayurveda Oil massages, which we also offer to you with a special 50% discount! This discount can be booked 8 days in advance, depending on availability. A perfectly relaxing weekend in the middle of tropical nature, just 2 hours south of Colombo and 20 minutes inland of Galle Fort. Price Example: 2 Nights Amethyst Room (Comfort Double Room, as a Single or Double Room, incl. breakfast), 2 x 90min Yoga, 1 x 90min Massage = 223 USD. Just send us a mail and we send you the voucher and further information. We do offer interesting room & suite discounts to all yogis, when you will book a retreat package! 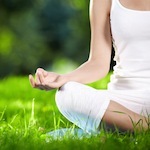 Wonderful relaxation with exactly the amount of yoga that is good for you.